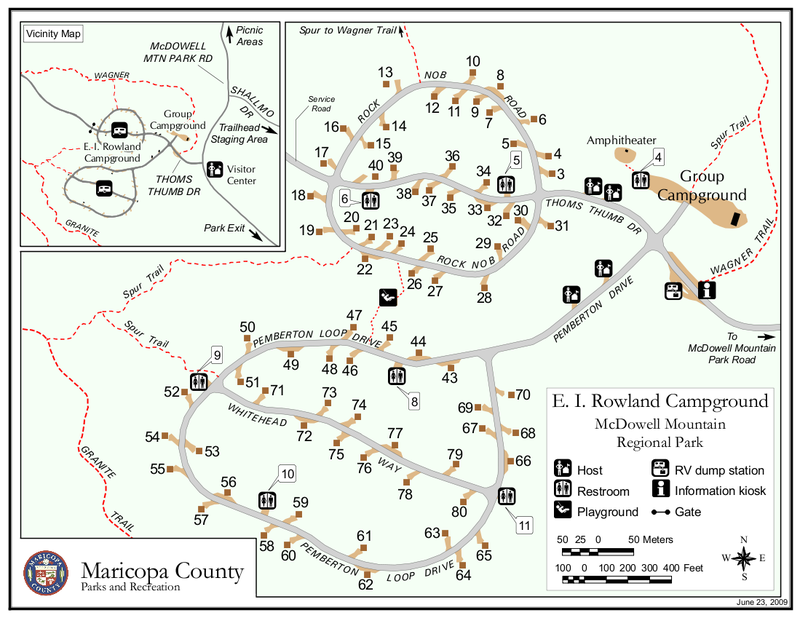 This trail segment is split between the McDowell Sonoran Preserve (0.5 miles) and the McDowell Mountain Regional Park (0.6 miles) and is a picturesque short trail that allows scenic loops between the two multi-use areas. 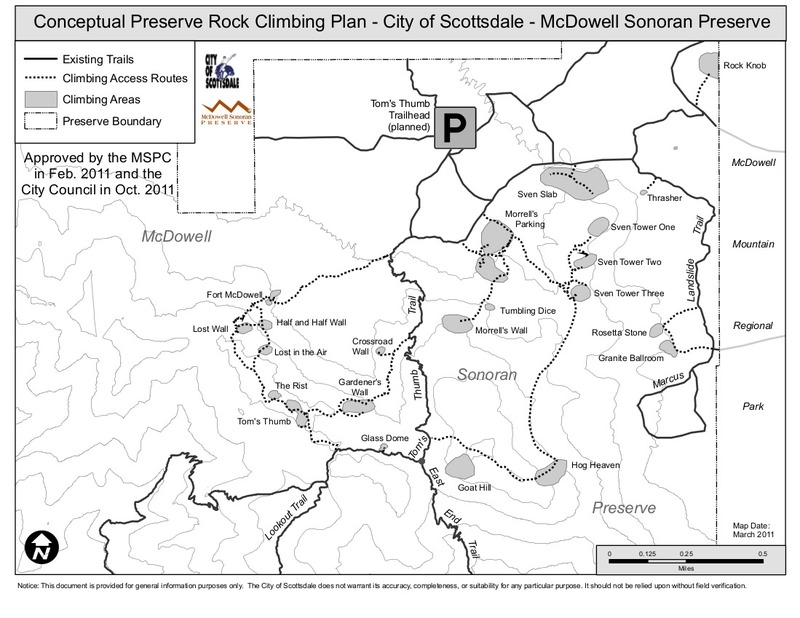 The GPS route and this description will start from the closer access point in the MSP (McDowell Sonoran Preserve). 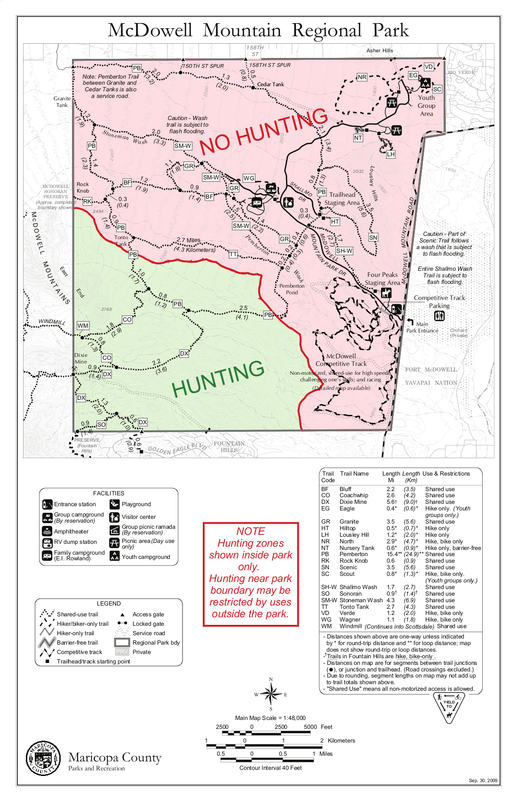 From Tom's Thumb Trailhead (23015 N 128th Street) where there is equestrian parking and regular parking but no water, you take Marcus Landslide trail 0.4 miles to junction with Rock Knob trail. The 0.5 miles of Rock Knob trail that are in MSP are lined with thick chain-fruit cholla and have a winding view of the beautiful Rock Knob granite outcrop. Sunrise and sunset cast spectacular light on Rock Knob formation and will get you many "likes" on social media posts of your pics. 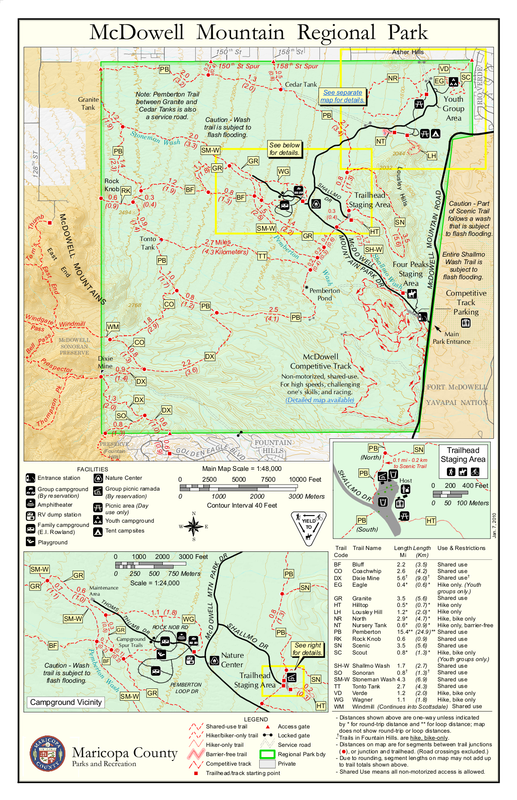 At 0.2 miles you intersect with Gooseneck Trail which links you to miles of Central and Northern trails all the way north to Granite Mountain. At 0.3 miles you will see ranching artifacts under an old mesquite tree. 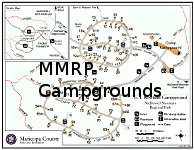 You cross into the McDowell Mountain Regional Park (MMRP) at 0.5 miles and there are paths for approved rock climbing routes. 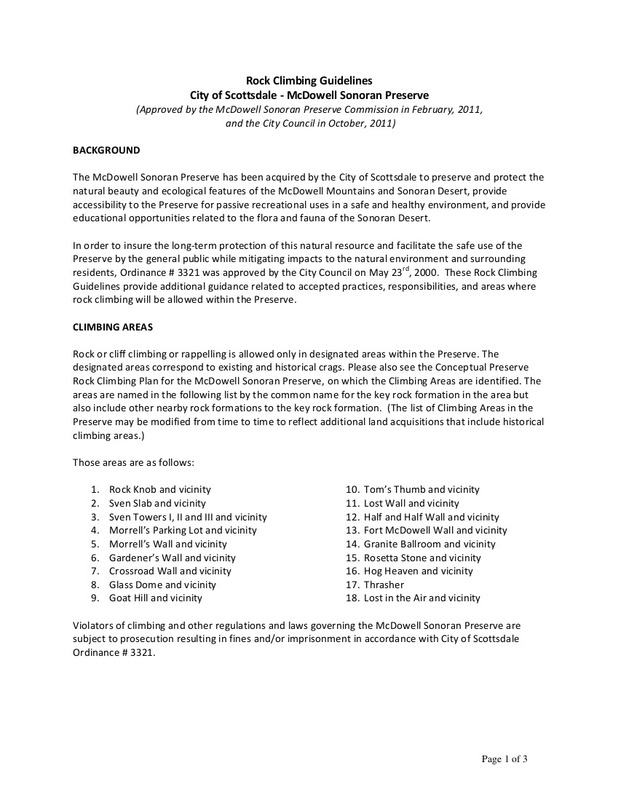 In some older rock climbing documents and books, the Rock Knob area is referred to as "Knob Hill" but the adopted MSP Rock Climbing Plan in 2011 made the official name change to Rock Knob. 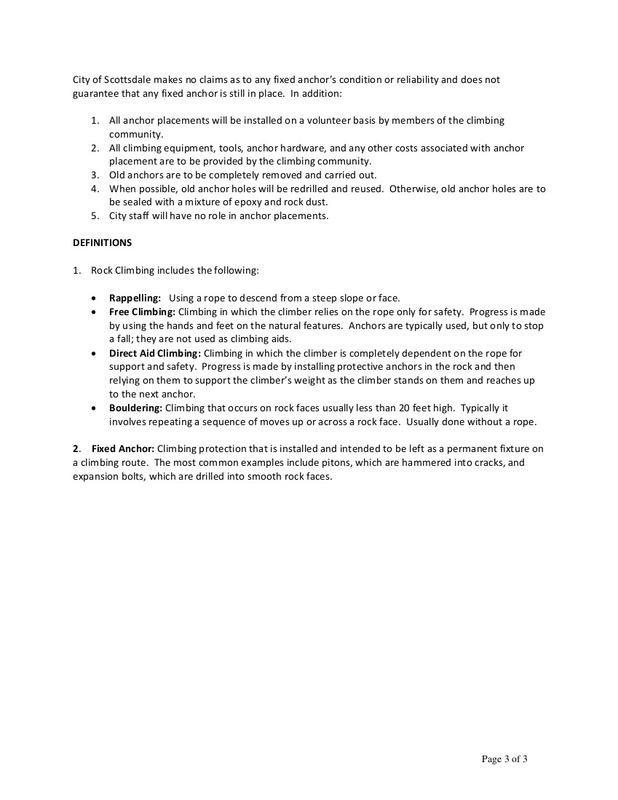 If you want to read the official rock climbing guidelines for the MSP approved in 2011 - read here. Continue on Rock Knob trail within MMRP to the intersection with Pemberton Trail. 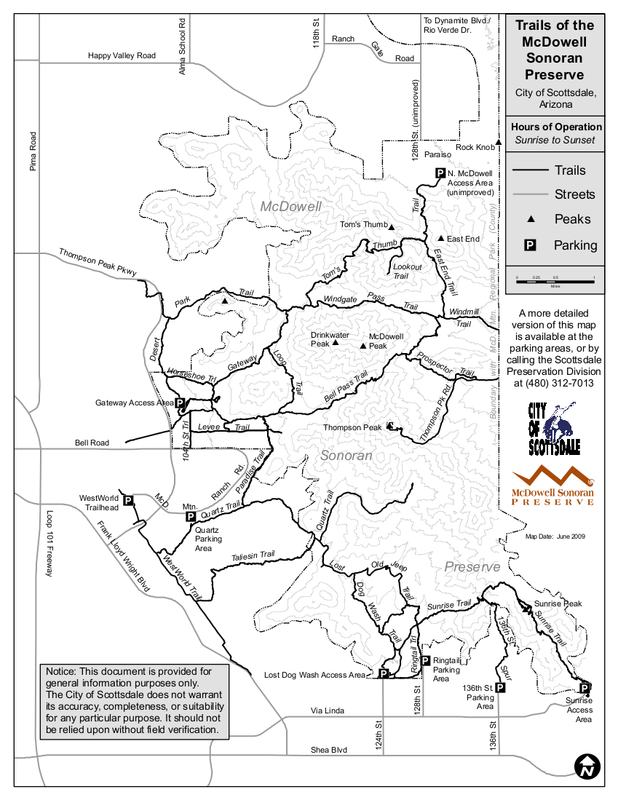 You can connect to backside of Windgate Pass by taking Pemberton to Coachwhip to Windmill Trail. 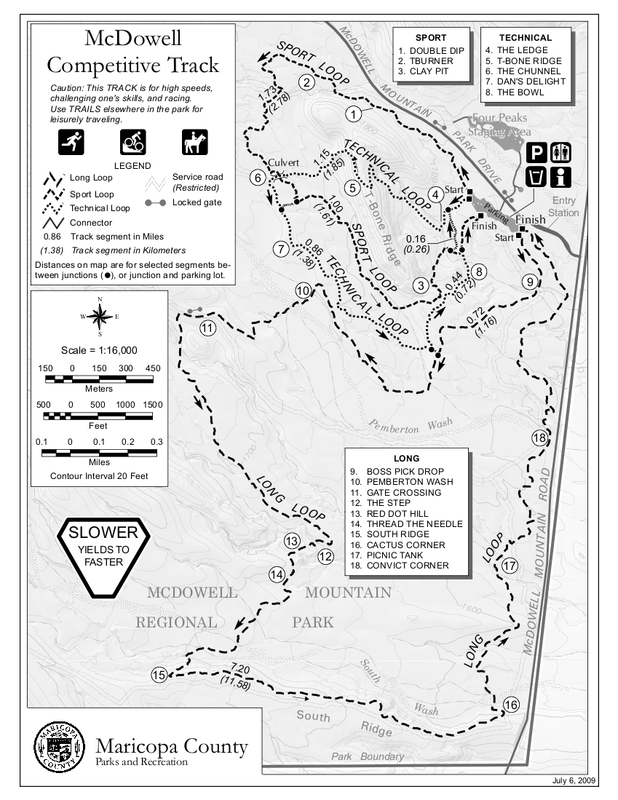 Or you could take Pemberton Trail to Boulder Trail and make a little loop to Marcus Landslide trail. Many great options by foot, bike, or horse in this area. 6) East on Happy Valley Rd until it turns north and changes to 116th st.
From Exit 36 of AZ-101 Loop North, head northeast on North Pima Rd 4.7 miles to East Happy Valley Road. Turn right onto East Happy Valley Road and drive 4.3 miles to Ranch Gate Road. Turn right onto Ranch Gate Road and travel 1.3 miles and then turn right onto North 128th Street. After 1.0 mile on North 128th Street, you'll be at the trailhead gate. No water at the trailhead! 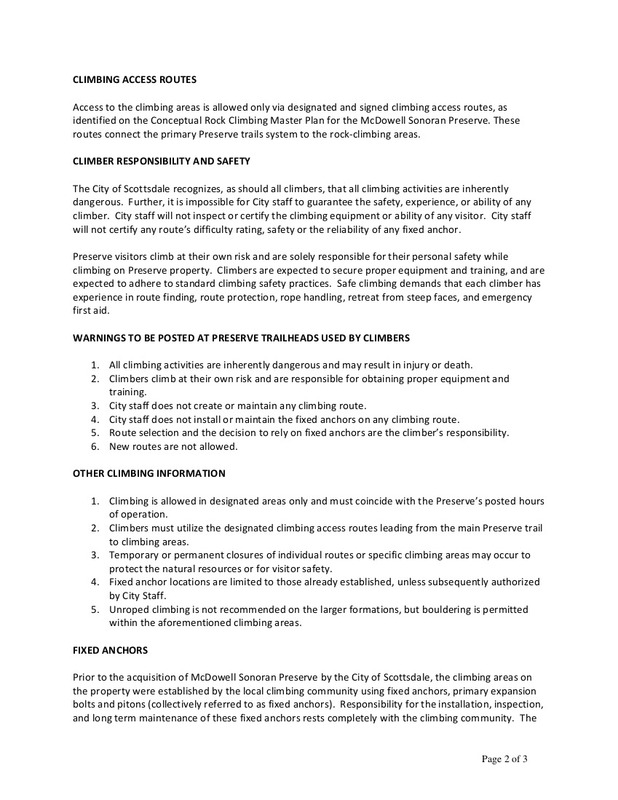 Bathrooms are non-flush. If you just pop in the coordinates of the trailhead, it's very possible that your GPS unit will tell you to wrong turn from Happy Valley Road onto Alameda Road at ( 33.706667, -111.832396 ). Don't do it! Those GPS units don't know that there's a locked gate at (33.694441, -111.813335).